The whole interview is well worth reading but let me pick out a couple of items that struck me particularly. 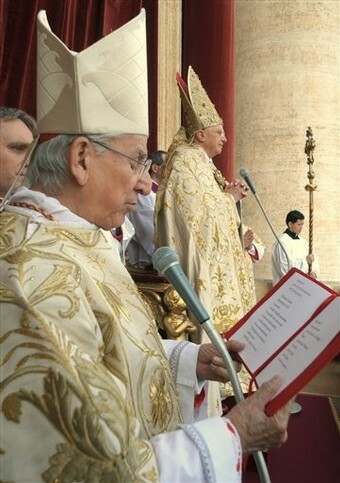 First of all in regard to vestments:Pope Benedict XVI recently said in an address that "society speaks with the clothes that it wears." Do you think this could apply to the liturgy? The Linacre Ethics Forum offers chance for junior healthcare professionals and students to explore and discuss Catholic healthcare ethics. Each month a senior practitioner or other expert is invited to give a 30 minute presentation, followed by discussion. The aim will be to understand the Church’s teaching, and explore ways in which we can present it sympathetically to patients, colleagues and managers. Medics, nurses, pharmacists etc. are all welcome. For more information please email Stephen Barrie. The talks are all at 7.30pm in the Abbey Hall. An interesting new blog is Chiral Capers (Observations of Japan in matters cultural, photographical and theological.) The blog is placed under the patronage of the Sancti and Beati of the Order of Preachers. The author, Robert Bautista is an undergraduate student of science and international studies at the University of Technology, Sydney and has been sent to study at Yamanashi in central Japan for a year, to conduct a cultural immersion and research programme. At his blog, he intends to document his experiences with a special emphasis on the state of the Catholic Faithful in Japan. He does not leave until 1 April but in the meantime will post items of interest related to the Church in Japan. 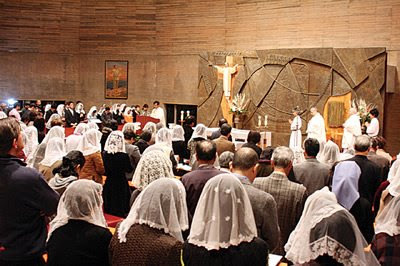 The photo above is from Japan Catholic News and shows pilgrims at Shiroyama Catholic Church. This is from a collection of photos from the beatification of Peter Kibe and 187 other Japanese martyrs at Nagasaki last November. 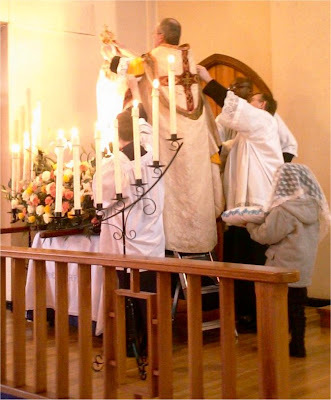 After a couple of weeks, I invited him to serve, I don't normally allow servers to start until they have made their first Communion but if they turn up for Stations or Benediction, I stretch a point. Things have gathered apace. This evening, we had three new young servers (soon to make first Communion) who tagged along with the older ones, keeping their hands joined reverently throughout. The distinctive grace of the sacrament is the gratia ad robur, grace for strengthening, as the perfection of the grace of Baptism, enabling us to bear witness to the faith - if necessary even unto death. 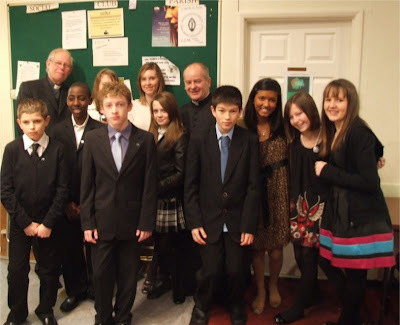 In my diocese, the custom is for Confirmation to be conferred in year 8 (12-13 years of age) and it was great to see such hope for the Church of the future. 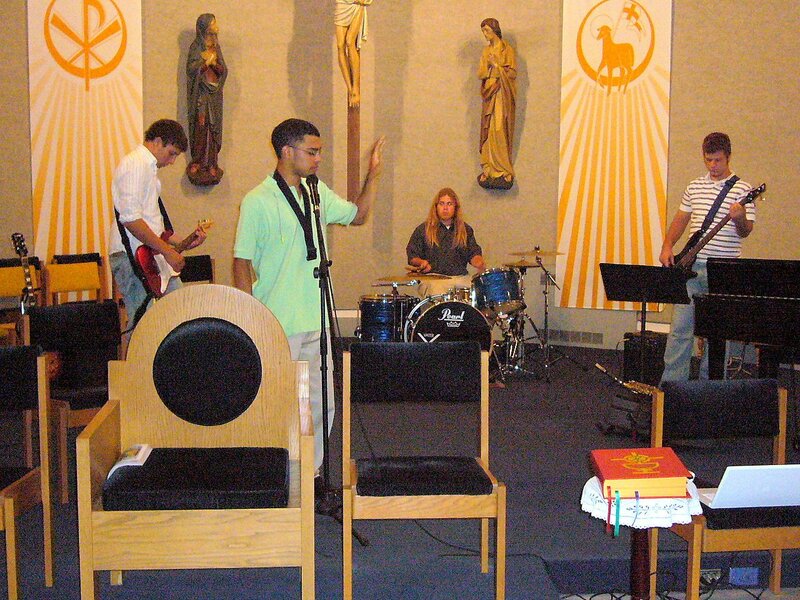 Please pray for our youngsters that they will remain firm in their Catholic faith. Gotcha! You all thought I was going to say earnestly that Lent is not about giving things up but about doing something positive. I'm glad to say that this mantra is now becoming part of the recognisably tired corpus of the "reform that has to be reformed." Every year on Ash Wednesday I try to work the point in somewhere that nothing stops us from doing both. Celebrating Septuagesimatide gives a neat opportunity to preach for three weeks on prayer, fasting, and alsmgiving - these topics can also be related easily enough to the scriptures read in the usus recentior and provide a good lead-in to Lent. Sorry I haven't got a parish "Paypal" button yet - I'll try and get that going. 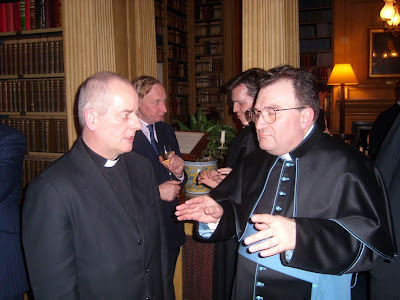 Fr Ray Blake has just sent me this photo of myself and Mgr Wach. It looks as though I am rather cross with him. I can assure you I was not. Please remember Guy Hawley in your prayers. Aged 55, he died suddenly and I celebrated his funeral Mass today, followed by the burial at Sidcup Cemetery. Please remember his wife and children in your prayers too. While waiting around afterwards for a lift back in Udens undertakers' Rolls Royce, I said a prayer at a few graves I recognised. It is a strange feeling being in a cemetery where I know so many of those who are buried. 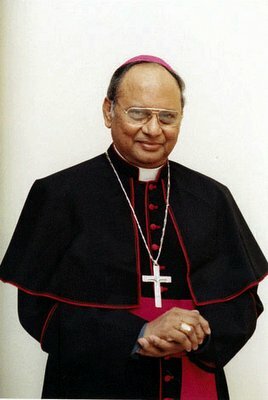 Archbishop Malcolm Ranjith, the Secretary of the Congregation for Divine Worship, has written the foreword to a book to be published in September by Roman Catholic Books, "True Development of the Liturgy" by Msgr. Nicola Giampietro. Catholic World news has a feature on the foreword and NLM has its own piece by Gregor Kollmorgen. 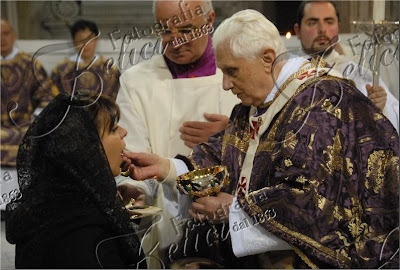 Raffaella has linked to the article on her Papa Ratzinger Blog. Many thanks to these influential Italian blogs for coming out so strongly in support. 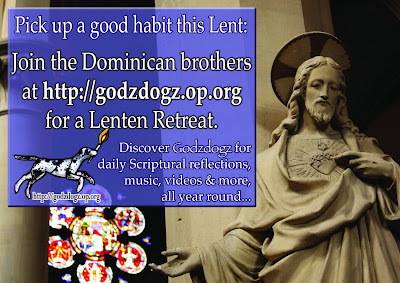 The Dominican Studentate blog, Godzdogz have announced their virtual Lenten Retreat with daily Scriptural reflections, music and videos. One of my favourite devotions is to make the Stations of the Cross. I even have a set of meditations on the Stations on my mobile phone so that if I am away anywhere and do not have any book of meditations, I can always use them. 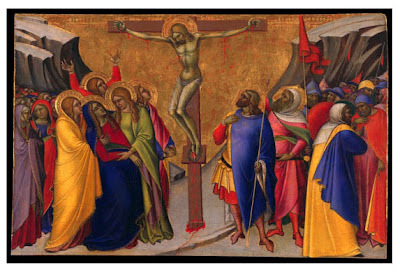 The saints who wrote on the spiritual life tell us that the passion of Christ is always a worthy subject of meditation and the Stations are a good way of framing such prayer. Family Publications have recently published two fine pamphlets with the Stations. First of all, there is the shorter set of meditations by Cardinal Newman. These are included in his "Meditations and Devotions" - I have a copy from 1893 which I picked up many years ago as a student. Family Publications have set them out in a fine glossy pamphlet with good illustrations. Many thanks to Fr Hunwicke for his friendly and extraordinarily perceptive open letter with an amusing story of the Vicar of Cury and Gunwalloe. Today, bloggers Fr Ray Blake, Jane and I met up at the Ha Ha bar at Victoria for lunch. 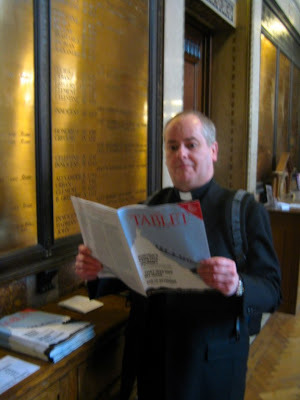 Fr Blake suprised me at Westminster Cathedral while I was being horrified by the latest issue of the Tablet. Can someone tell me - why is this paper on sale at the Cathedral? The Tablet have contacted me to say that my fisk of the article "That was not my Mass" was a breach of copyright and would I remove it. The last ditch liberals really do not understand the internet, do they? See also a letter from James MacMillan reported on Holy Smoke. Jane Teresa of the blog My heart was restless passed on to me the story of a martyr priest from the time of the French Revolution who went to his death on this day in 1794. 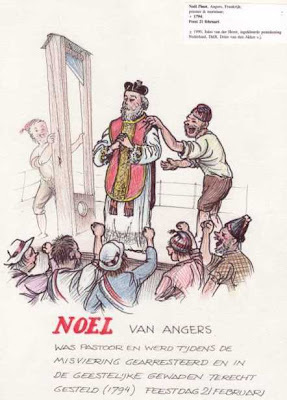 He refused to take the oath of allegiance to the "Civil Constitution of the Clergy", a law passed by the Constituent Assembly of the Revolution which subjected the Church to the civil government. Many priests and religious understandably fled the country and did great work elsewhere - including the USA. A brave few actually stayed on to minister to their flock - among them Blessed Noel Pinot. After refusing to take the oath he had to go into hiding but he came back publicly after the initial success of the rising in the Vendée. In Hoc Signo Vinces (Paulinus) to whom H/T for the above photo: he promises us further examples. Many thanks to Damian for his humorous post on Holy Smoke today featuring the above video. I thought it would do well as a header for this post in which I want to thank all those who have written about the article in the current issue of the Tablet which I responded to yesterday. So many very kind things have been said, many thoughtful points added to the discussion and a good dose of humour. The support of the Catholic blogosphere has been quite overwhelming and I am deeply grateful. Tomorrow, I will be in Oxford so I will be saying a private Mass early. I will offer it for all of your intentions. As of writing, I have received 129 comments on the "Responding to the Tablet" post. They have all been kind and encouraging. I have also received many emails in the same vein. Your support is very much appreciated. Sir Dan "blog reader extraordinaire" has just left me a phone message listing all the blogs that he has read with supportive posts and so I will now have a look through those. The Tablet have asked me to remove this post because it is a breach of copyright for me to quote their article in full while commenting on it. It is hilarious to see the Tablet failing utterly to grasp the concept of publishing on the internet. Today's Vatican Bollettino announces that the English Archbishop, Paul Gallagher, until now Apostolic Nuncio in Burindi, has been appointed as Apostolic Nuncio in Guatemala. Last April, his residence in Burundi was mortared (probably not as a deliberate target) while he was out of the country. He made arrangements to return immediately to his post regardless of the danger. Please join me in praying for Archbishop Gallagher in his new appointment. Public speaking classes have always been an opportunity for students to propose opinions that may be subversive or unacceptable to the authorities. It seems now that among the most subversive position for students to promote is that of being pro-life and pro-family. All the articles from the January-February issue of Faith Magazine are now available online (free of charge). There are a couple of interesting and provocative articles on Thomism, an excellent piece by Fr Marcus Holden on Pope Benedict XVI and the Reform of Biblical Exegesis and much more. Last August, Nancy Pelosi, the Speaker of the US House of Representatives made a statement dredging up the tired old nonsense about about how some theologians 500 years ago did not know about the development of the unborn child and therefore speculated on the time at which the soul was infused. As I pointed out back then, none of this has anything to do with the morality of abortion since all the said theologians were resolutely against abortion at any stage. Several US Bishops came out with statements correcting the misconceptions given by Pelosi and there followed an excellent fact sheet from the US Bishops Committee on Pro-Life Activities giving a concise and helpful answer to Pelosi's contention that the church's teaching on abortion has changed or is of recent origin. Alcuin Reid was on Radio 4's "Beyond Belief" programme broadcast yesterday. 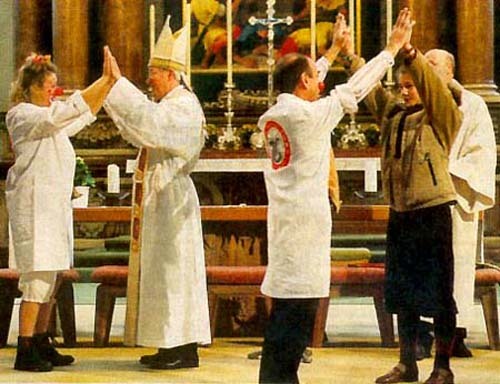 The subject was the lifting of the SSPX excommunications and its various implications. He was put in a contest against two opponents and came out of it very well. There is much in the piece about Vatican II and Alcuin manages to give some good clarification under fire about the different levels of assent required for different kinds of documents. Since I am sometimes rather negative about the BBC, I should say that the presenter, Ernie Rea, was quite fair and balanced. My inbox has been deluged with many kind messages and I have tried to reply briefly to everyone but please excuse me if I have missed anyone out. Thank you very much for your encouragement and thanks to all of you who have commented so supportively on the post Parish dispute "goes loud". I'm away again tomorrow, have appointments all day Thursday, am teaching at Parkminster on Friday and giving a talk at the Linacre Conference in Oxford on Saturday - but I'll try to keep up in various spare moments! 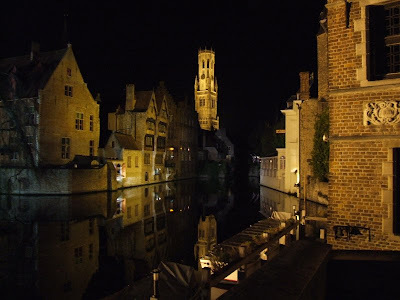 As this week is the seminary and school half-term holiday, I managed to get away for a couple of days to Bruges, one of my favourite European cities. With the new station at Ebbsfleet only 20 minutes away by car, I can be there in a few hours via Eurostar. There are several Churches open during the day and I enjoy walking from one to another, saying some of the office in each one. The Church of St Elizabeth at the Beguinage is the quietest, but the Cathedral of Sint Salvator and the Vrouwekerk (Church of Our Lady) have little chapels set aside for prayer as well as boasting some wonderful works of sacred art. Then there is the Basilica of the Holy Blood where the relic can be venerated each day. (In English, we would normally refer to the "Precious Blood" but "Holy Blood" seems to be the official designation.) On this visit, I enrolled into the "Pious Society of the Most Precious Blood." 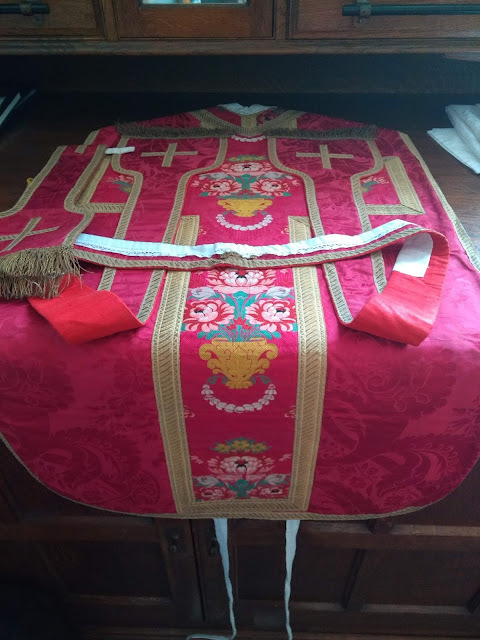 In late October, one of my parishioners sent an email to various others, including myself, the Archbishop and the Area Bishop, complaining about various aspects of the Liturgy as celebrated at Blackfen. The discussion rather took off and many different points were raised over a lengthy exchange of emails that became difficult to keep track of. Eventually, in the midst of preparations for Christmas, I circulated a paper ("Sacred and Great") that I wrote in an attempt to help people to understand the nature of the Liturgy and its development, and to counteract misunderstandings about the Liturgy. 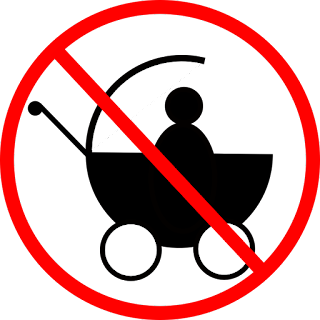 Bishop Pat Lynch (the local area Bishop) was very helpful and, after Christmas, met with those who were unhappy as well as with a small group of those who like the usus antiquior and those who are neutral but don't see any problem in having it as part of parish life. The other day at our Deanery meeting, I was not sure whether the priest whose turn it was to lead the prayers would be able to come. He was in fact, but I prepared some just in case. We usually have a short reading from some suitable book and so I trawled "Priests of Jesus Christ" edited by Fr Gerard Skinner, and published by Family Publications. The book is a selection of various addresses and writings of the Holy Father on the priesthood. He is in a conversation with God because the texts of Holy Mass are not theatrical scripts or anything like them, but prayers, thanks to which, together with the assembly, I speak to God. Emma Kirkby is the Soprano. Conductor is Christopher Hogwood: The Academy of Ancient Music. Sublime! 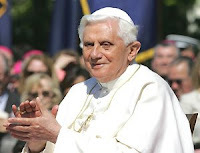 Last week, I mentioned the Letter in Support of Pope Benedict. It is most interesting to see in this NLM story that three French Bishops have signed the Letter: Bishop Dominique Rey of Fréjus-Toulon, Bishop André Fort of Orléans, and Bishop Marc Aillet of Bayonne, Lescar and Oloron. The petition currently has 41,247 signatures. If you haven't already done so, Sign Up Now! The Sisters of the Gospel of Life have put out An appeal. They need transport to deliver baby items around the place to mothers they help in their excellent work but their van blew up and they had to get another motor. A friend loaned them the money to get on the road again but they need funds to repay the debt. I'll send some wonga - so go on, get out yer cheque book! "The Cardinal Winning Pro-Life Initiative"
UPDATE - The Sisters also have a button on their site for donations via paypal. The Sisters are very polite and understanding. They recognise that these are difficult times and say, "Please feel under no pressure to give." You hear that? These are nice understanding sisters. Don't expect the same niceness here. Feel under plenty of pressure to give. Now. And don't be stingy - or I'll send the boys round. At Seattle Catholic, you can read the story by Matthew Anger of the heroic midwife of Auschwitz, Stanislawa Leszczynska. The conditions under which mothers had to give birth were quite horrific and babies were routinely drowned in a barrel after being born:These operations were performed by Schwester [sister] Klara, a German midwife who was imprisoned for infanticide. "As a Berufsverbrecherin (one guilty of occupational crime), and thus forbidden to practice her profession," says Stanislawa, "she was entrusted with a function to which she was more suited. "The heroic midwife, at the risk of her life, refused to participate in the infanticide. Instead, she offered care for the women as far as she could in the appalling conditions in which she worked, and made sure that the children were baptised. Few of them survived very long. On one occasion, she faced down the infamou Dr Mengele who shouted at her that "Orders are orders!" 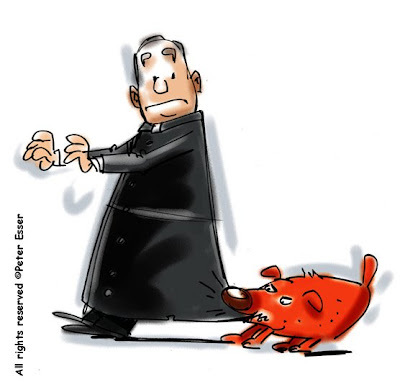 Thanks to Rorate Caeli for the link to a translation of Martin Mosebach's recent article in Der Spiegel: The Body of the Church. Why the Pope Had to Do What He Did. The translation is provided by Stuart Chessman of The Society of St Hugh of Cluny blog over in Connecticut. The sad news has come through today that three third year seminarians of the Society of St Pius X were killed today in an avalanche while walking in the Swiss mountains. A fourth was rescued and taken by helicopter to hospital. Abbé Christian Thouvenot asks for prayers for the repose of their souls and prayers for their families and for their confreres at the seminary community. Richard Marsden has posted an article about the party on Saturday. At the morning Mass, he had his first experience of the usus antiquior and it is interesting to read his reflections: summed up in the phrase "there was no faffing about". He says:I thought the best plan of action was to just sit at the back, observe and join in with the Latin I knew, without trying to flick around in the booklet to follow it.I think that this is a good approach for anyone who is new to the older form of the Mass: you can look through a booklet or missal later when you are a little more used to what is going on. H/T to Fr Ray Blake for this family video which powerfully illustrates the value of a thbe life of a little girl with trisomy. The doctors said it would be blessing if she died. The family's love shows that it was a blessing that she was allowed to live and that "God doesn't make mistakes." Rorate Caeli reports on an interview given by Cardinal Castrillon Hoyos to the RCN RAdio Network of Colombia. Here is a link to a report of the interview (in Spanish). His Eminence reiterated that any honest man would reject viscerally what happened in the holocaust, that he personally rejected it and agreed with the Church that we should never forget, so that humanity never repeats these atrocities. He also spoke of how the Holy Father wanted the Church to move forward to ensure that the unity of the Church be rebuilt, and added:"[W]hat is important at this moment is that the Pope has stopped a schism. The charity that Christ wanted to exist in the Church has been remarkably reestablished, and paths of hope are opened. "For the record, Bishop Williamson has been removed by the SSPX from his post as Rector of the Seminary of La Reja in Argentina.